Luxury holiday villas in Fontvieille. A very special property with private pool near Fontvieille, Bouche-du-Rhone, Provence. Artifacts and good books are abundant. 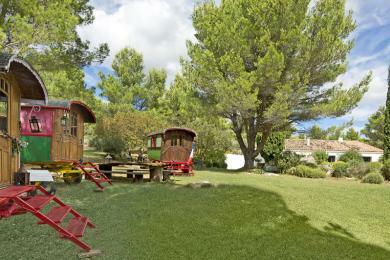 We also like the 3 gypsy caravans in the garden. Great fun for the kids! The villa is situated on large grounds of about 4 hectares. 100% peace and quite. Sleeps up to 8 guests.